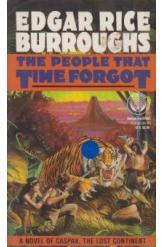 The People that Time Forgot Edgar Rice Burroughs Sci Fi. Book is in good condition, all pages intact. Sailor Bowan Tyler was lost on the unexplored continent of Caspak, in the Antarctic sea. Tom Billings leads an expedition to rescue his friend, but finds himself faced with monsters from Earth's prehistory that have survived in the dark, frigid continent.